The Congressional Gold Medal, our nation's highest civilian honor, has been given over 200 times. Fewer than 10% of the medals have been received by women and just five (5!) have been awarded for outstanding contributions in air and space exploration. The good news is that legislation to award Gold Medals to the “Hidden Figures” is moving forward and the better news is that momentum is building to also support a nomination for the First Lady Astronaut Trainees (FLATs), also known as the “Mercury 13”. I first learned about these women when I read Martha Ackmann's book and had the privilege of meeting both Martha and Wally Funk, one of the FLATs, when they visited Albion College in 2008. As a result of this visit, I have started a campaign to nominate this group of 13 women aviators for the Congressional Gold Medal. The FLATs were tested for “the right stuff” by NASA doctor William Lovelace almost 60 years ago and proved themselves to be just as good as, if not better than, the Mercury 7 astronauts in withstanding extreme physical and psychological tests. Results of the tests eventually lead to the inclusion of women within NASA’s astronaut corps, with Sally Ride paving the way for American women in 1983 and Eileen Collins becoming the first female pilot to command a space shuttle in 1995. 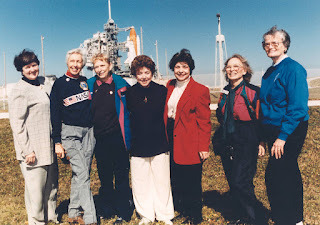 Members of the FLATs, at the launch of shuttle pilot Eileen Collins in 1995 (NASA image). To support the nomination of the FLATs for the Congressional Gold Medal, sign the petition and/or contact your local representative. Thank you!